What is the best method for connecting a Java application to CICS? There are a wealth of options that are available, ranging from using the Java class libraries that are shipped with the CICS Transaction Gateway (CTG), to using the Common Client Interface (CCI) component of the Java 2 Enterprise Edition (J2EE) Connector Architecture. There are also important application development choices to make, such as whether to code to an API directly, or to use a tool such as VisualAge for Java’s Enterprise Access Builder. 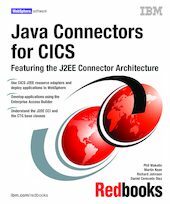 This IBM Redbooks publication examines the strategic Java connection methods for CICS. The focus is on the use of the J2EE Connector Architecture, which is a new Java standard for connecting to legacy Enterprise Information Systems such as CICS. This builds upon the previous IBM Common Connector Framework (CCF) and provides enhanced facilities for deploying into a managed environment, where connection pooling, transactions, and security are managed by a J2EE capable application server such as WebSphere Application Server. We provide comprehensive code examples for the J2EE CCI, as well as the CTG base classes, including the ECIRequest, ESIRequest, and the EPI support classes.